Installing a power window set-up is not too difficult but is very time consuming. If you have not done a similar installation, expect to spend at least a day to do the installation, maybe two. A good weekend project for the novice. PW set-ups are the same for all A-body models from 1969-72 such as Cutlass, Chevelle, LeMans, Skylark. 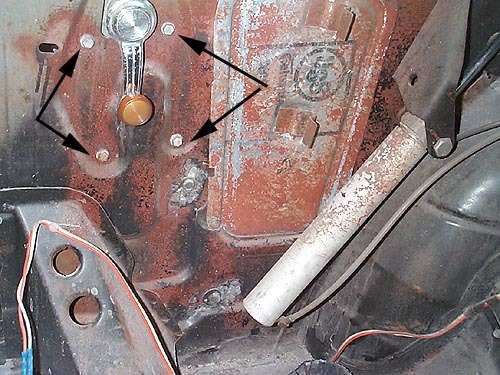 Also, 1969-72 Pontiac Grand Prix models use the same set-up except the master window switch on the driver's door panel is a square configuration instead of the straight row. You can easily splice in a straight row plug to change it. Also, 70-2 Monte Carlo models use the same set-up. 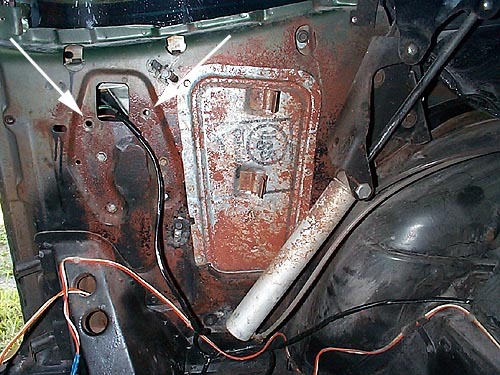 1968 A-body models have the same rear set-up but the front doors use separate regulators due to the vent windows. The 68 set-ups are harder to find and will share the same regulators as post-coupe(2dr sedan) models but typically those "cheap" models don't have PW. 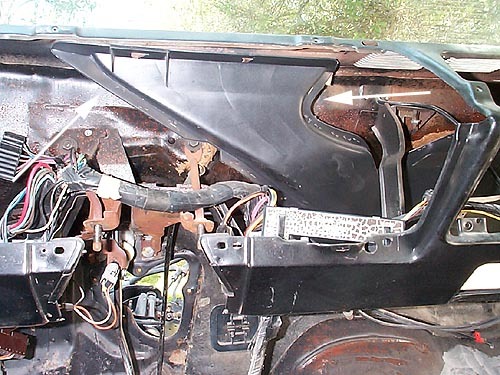 All 69 Cadillac and some 70 Cadillac 2 dr models use the same front window regulators and motors. Cadillac 2 dr rear window regulators will not work. On the regulator main mounting stamping you will see 34. The right side regulator arm will have 1670 stamped on it and the left side will have 1671. 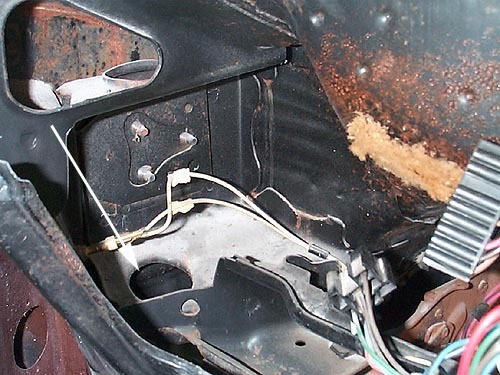 The biggest task of installation is the removal of basically the entire interior and dash. 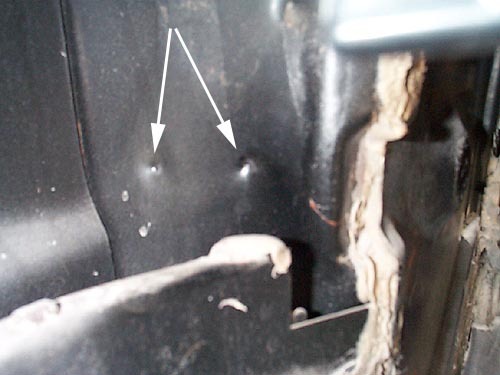 The doors will also need to be removed from the car in order drill the flexible boot holes in the cowl and the door. The first place to start is to mask off the door-to-fender gap with masking tape to prevent any unnecessary scratches and/or chips. Have an assistant either hold the door open as you remove the hinges screws or have a floor jack placed under the door with a towel for the door to rest upon. Remove the six screws and slide the door away. It is also a good time to check for hinge pin wear and rebuild the door hinges if necessary. Now, you will need to remove the interior: door panels, kick panels, front seat, rear seat, rear side panels, carpeting rolled to the pass. side, dash pad, instrument cluster, etc. As the pics will show, the factory routing of the pw and pdl harness are basically the first items to go on the firewall before all other items. Start at the fuse box. If you car does not have any power options, you will need to open the fuse box to gain access to the back side of the panel. 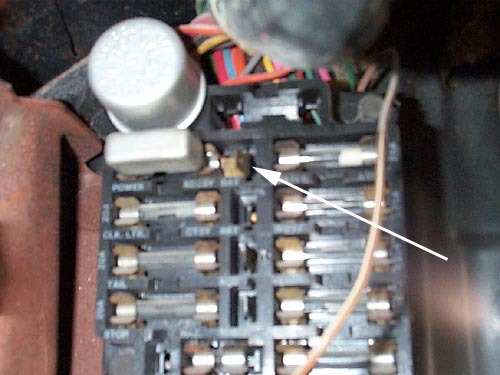 Notice the white arrow pointing to the master power wire tang. This is the item that will have to be inserted from the back side of the fuse box. 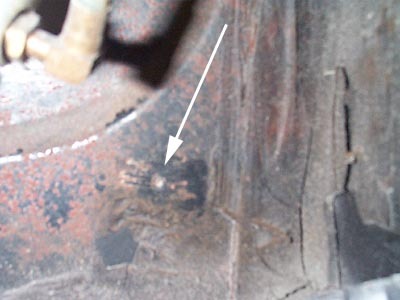 This is the most common item missing when a PW set-up is removed from a donor car. Also, notice the large master power fuse(to the left of the tang.) This is another item commonly missed. You can get the master fuse from most auto parts stores. 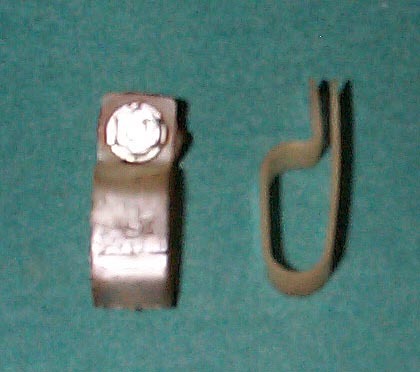 The tang can be purchased from Radio Shack and is called an in-line fuse holder. Here is the master power wire on the left that plugs onto the tang above. The pink "turn on" wire goes to the fuse box marked "ign" This wire does not have power until the key is moved to the "on" position. This limits the pw to work only when the key is on. The white arrow indicates the raised ridge on the plug so it can only plug into "ign" fuse box sockets. If you want the windows to work regardless of key position, you will need to change the plug to one where you can plug it into the "bat" fuse box terminal which is direclty below the master power wire tang in the pic above. 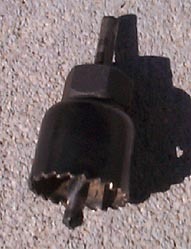 Here is a the master power splitter. 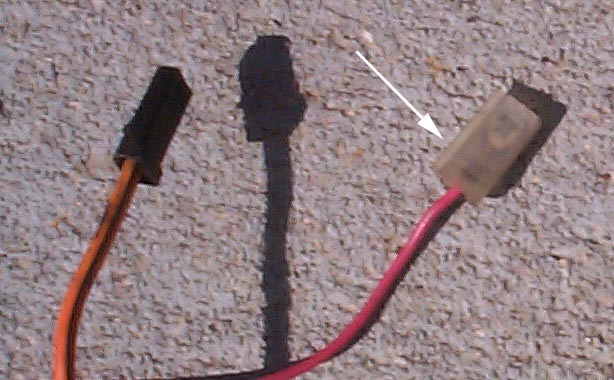 The red connector plugs on the master fuse tang(black arrow.) The white arrows on the right show the three sockets for other power options. These would be for PW, PDL, PSeat. Also, notice the white arrow on the red connector. 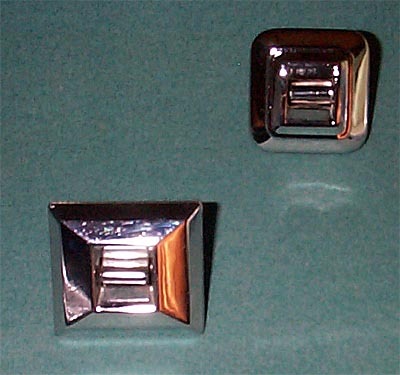 This socket would be for convertible power tops or another power accessory such as power trunk. This is the view inside the driver's side kick panel. Two dimples indicate the location for the PW relay. Use a 1/8" drill to make two holes for sheet metal screws. 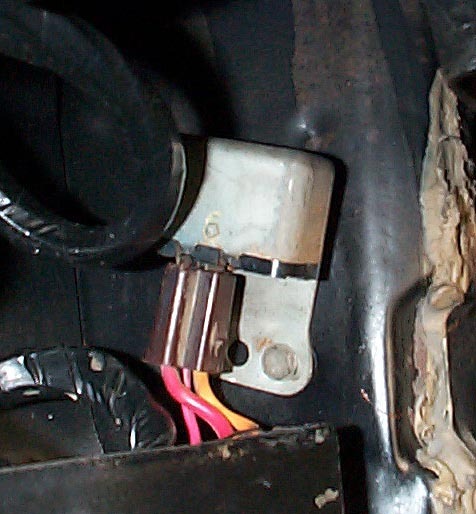 This is the PW relay that mounts inside the driver's kick panel. 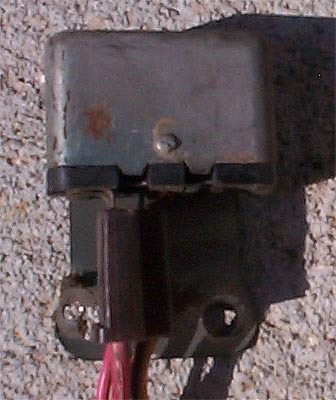 The pink "turn on" wire activates this relay to allow power from the fuse box master power tang to the PW wiring harness. This is the view of the driver's side cowl. Notice 3 dimples. The center dimple locates the opening for the flexible boot. The other two are the plastic retainer pins that hold the boot to the cowl. 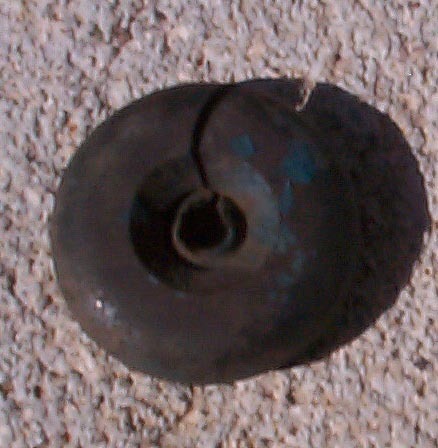 The main hole is 2.25" and the retainer pin holes are 1/8". Use a door hole saw for the 2.25" opening. These are available at home centers and one will be pictured below. 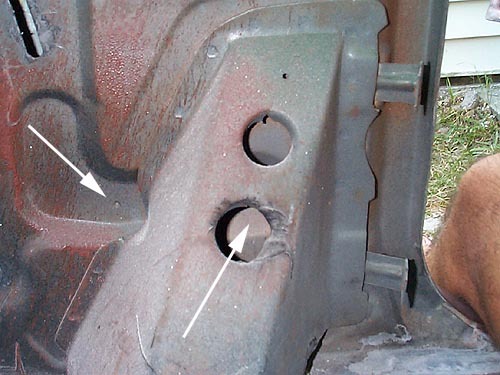 Use some WD40, PB Blaster or Liquid Wrench to lubricate the hole saw which will keep it cool and reduce friction. The door hole saws are made for wood but will work on metal if you keep drill rpms low. Take your time and place light pressure on the drill to prevent the cutting teeth from becoming dull. Here are the same set of dimples on the door. Use a 2" door hole saw for the main hole. 1/8" for the other as stated above. This view shows the driver's side cowl with the instrument cluster removed from a 70 GS455. Notice the lower left corner. This is the hole just drilled in the cowl for the flexible boot. 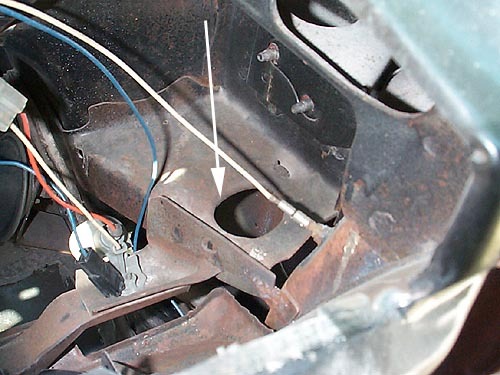 The arrow indicates the routing of the cowl wiring harness that connects the driver's side to the pass. side wiring harness. Also, directly below the arrow is the location for the relay previously pictured. Here is a pic of the firewall from the pass. compartment. Notice the white arrows pointing to each side of the front defrost duct. The cowl harness must pass behind the duct and is held in place by small plastic wire holders. There are appoximate 4 of them attached to the cowl using sheet metal screws. Here is a pic of the plastic wiring harness clips. Here is a pic of the pass. side cowl. 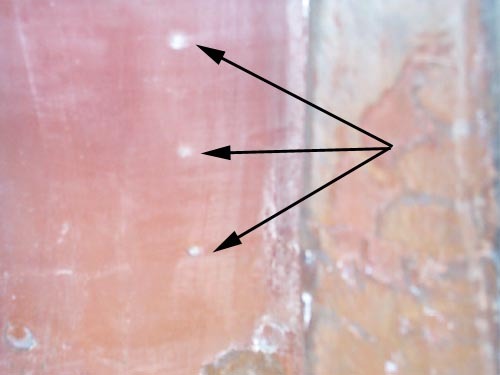 The arrow indicates where the pass. 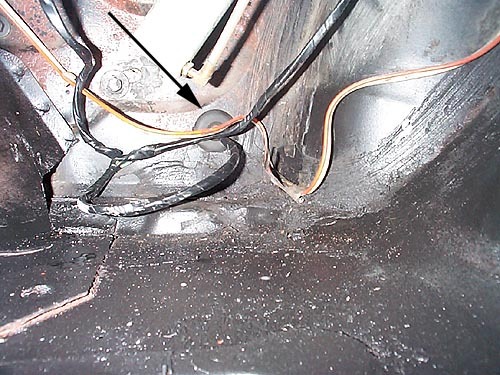 door wiring harness enters the cowl from the flexible boot and bends upward to connect to the cowl wiring harness. This is the driver's door w/the manual set-up still installed. The easiest way to do the conversion is to have an assistant hold the glass in the up position as you remove the screws indicated by black arrows. Make sure you mask off the opening where you will slide out the manual mechanism since the stamped steel edges are very sharp. Notice the manual crank handle position. The master PW switch will be located in the same position. The white arrows indicate where the PW regulator screws will be when you install it. Make sure you lubricate all tracks and rollers with grease to ensure smooth PW operation. This is a 34+ year old pw motor. 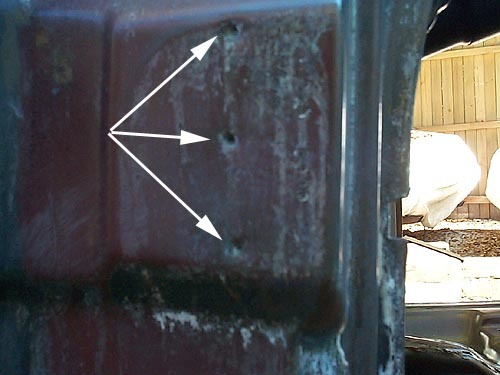 Notice how the factory grease has hardened. Remove all old grease and replace with fresh grease. 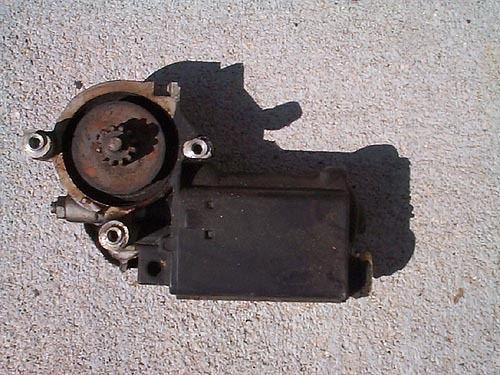 Reattach to regulator and then slide the entire assembly inside door or rear panel. Make sure regulator's roller slides into window channel and then line up mounting screw nuts with mounting screw holes. Here is the rear side of a 70 conv. 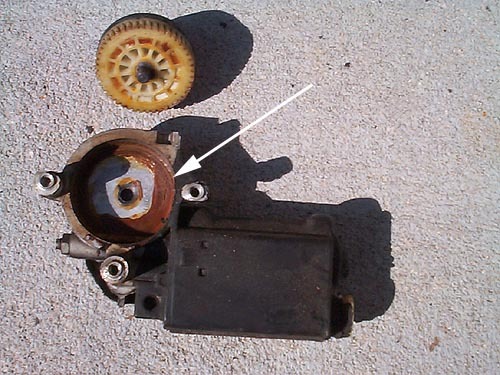 The black arrows indicate the screws to be removed in order to remove the manual regulator. Have an assistant hold the window up while you slide out the regulator. For convertibles, notice the panel with USS on it. This panel needs to be removed in order to slide out the regulator. Coupes do not have this panel. The white arrows indicate the holes for the lower PW regulator screws. The screws are 1/4" diameter so use a 1/4" drill or slightly larger to drill these two holes. Here is the lower rear dimple for the wiring harness grommet. This hole needs to be drilled with a hole saw. Diameter is 1.25"
This is the door hole saw you can find at home centers. Made for wood but works on metal if you keep drill rpm low and use some WD40, PB Blaster, Liquid Wrench to keep the blade cool and helps lubricate cutting teeth. This is the rear wiring grommet. One per each rear window! Here is a comparison of early and later model switches. The one on the upper right is early 1965-70. The lower left one is for 1971-1977. Here is the completed installation on the passenger side rear. Notice the white arrows indicating the old manual regulator position. 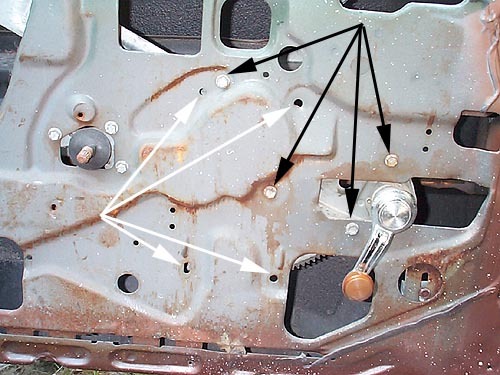 The screw heads located a couple inches below are the new positions for the power window regulator. These will have to be drilled. Once again, position is indicated by a dimple. Here is the rear grommet discussed earlier. Here is the completed installation of the relay.